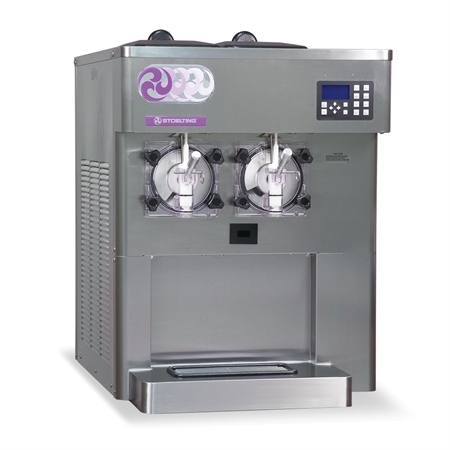 A compact, space-saver unit, that offers the convenience to serve frozen beverages, shakes, smoothies or frozen cocktails. The IntelliTec2™ control communicates with the operator through a multiline graphics LCD display using full text instructions. It features two large freezing cylinders for high volume dispensing and quick recovery. A high capacity refrigeration system with a 12,000 Btu/hr compressor produces volumes of shakes or frozen beverages. The stainless steel auger, heavy duty speed reducer and 1/2 hp drive motor set the standard for long life dependability. Each door is made of a clear polycarbonate that highlights pre-flavored products. Is ADA compliant for self service locations when paired with optional floorstand. Can easily be adapted to autofill accessories. Air and Water cooled units available.